Multimodal biometric security provider ImageWare Systems Inc. has released version 2.0 of its Biometric Engine (BE) physical security identification product. This product is designed for airports, seaports and other critical points-of-access for government and private enterprises. 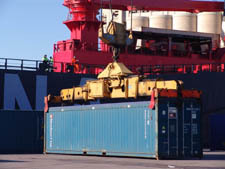 This update takes into account the SAFE Port Act, which requires foreign shippers to secure cargo being shipped to the U.S. and ensure the identity of those loading it. Shippers must manage this by 2013. The update–its first in five years–provides greater scalability, faster performance and improved distribution of biometric data. The product provides more support for larger identity populations and offers enhanced population filtering and watch list management. The system can integrate with existing identity management products and enterprise services bus technologies, as well as with existing security hardware, software and algorithms. While ImageWare has a strong foothold in the public sector, with this release it will target the commercial market, as private enterprises may have to finance the upgrades necessary to comply with the SAFE Port Act. ImageWare’s clients include Los Angeles World Airports and the Veterans Administration.